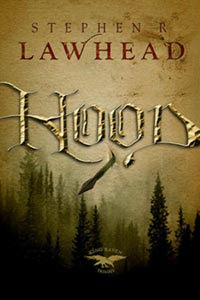 I had to read Hood because Lisa raved about the King Raven trilogy over at 5 Minutes for Books. I typically like the type of books that Lisa likes and I figured this was a safe bet. I was not in the least disappointed. Everything Lisa said about the book was spot on and I loved it! I've never read anything by Stephen Lawhead before and therefore was completely unfamiliar with his style. This book, published by Thomas Nelson, made me think that it would be a clean read and it was. The main protagonist, Bran, does live a rather loose lifestyle but Lawhead handles the character tastefully enough and gives you just enough information to know that Bran is a coward and a cad. After he has established Bran's less than stellar character, he moves on with the story (which is a twist on Robin Hood) in a completely artful manner and I got lost in the story. Hood is the first book in a triology so I don't want to discuss the details of the plot too intently. I don't believe this book stands alone and I don't see how I can get around reading the sequels. Nothing is concluded in the first installment but enough is given to the reader to create a curious thirst for more. Lawhead's style of writing is what makes reading this book so worthwhile. A lot of modern day fiction is irksome to me because it contains so many pop culture references that the books are instantly dated and branded as being meant for the present moment only. Not so with the King Raven triology. Lawhead uses language and paints scenes that draw you in so that you are never jarred out of the story. He writes seemlessly and the work is complex. I'm really very impressed and cannot wait to grab the second book, Scarlet . (I have a feeling that Jonathan is going to read and love this series too.) It's an all around winner with its clean adventurous fun. I haven't read the original Adventures of Robin Hood which is probably something I shouldn't admit but I can tell you one thing - this book is driving me towards them! Stay tuned for that as I will be exploring the character of Robin Hood in more detail in the very near future. 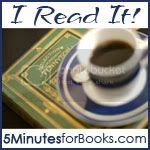 I'm also reading this book as part of the I Read It challenge over at 5 Minutes for Books. Have you read anything we've suggested over there? If so, write up a post about it and let us know! So many books, so little time. . . Sigh. Whew! What a relief! I am SO GLAD you liked it! :-) I think I've said once or twice that "Scarlet" is my favorite of the three, but all are wonderful! My teenaged son loves them as well. My husband really loved this trilogy. I read Hood a few years ago, but would like to go back and read it again before I read the next two. I'm almost finished with Scarlet, and it is just as good...maybe better...than Hood. I stayed up the past couple of nights not able to put it down! I hadn't heard of Stephen Lawhead, either, and I'm not a fantasy reader, but I'm adding the Pendragon Cycle to my TBR list! I am glad you liked this book. I read Hood in February and loved it! I am going to read Scarlet very soon and look forward to that read. After reading the rave reviews, I guess I need to add these books to my list too! I had no idea Lawhead had a new book out, yet alone three! I love the Celtic Crusades and the Pendragon Cycle and Byzantium is probably my favorite. Read more Lawhead. He's great. The whole trilogy is terrific.